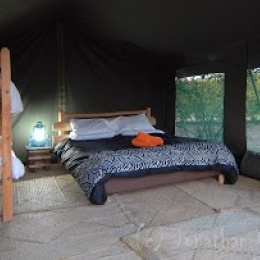 Pretty double or twin bandas, set amongst the 10 acres of stunning African bush at Punda Milias Nakuru Camp. Your banda has a private verandah area to sit out and enjoy the sights and sounds of the bush stretching out in front of you. If you care to venture from the comfort of your banda, you can enjoy our gorgeous swimming pool, with its sunbeds and poolside drinks service. Join us for breakfast, lunch and supper in our lovely restaurant offering a choice of snacks, light meals and 3 course dinners. Alternatively, make use of our self catering facilities, with covered cooking areas, water, electricity and even a BBQ!